Pixar Animation Studios has always had a keen eye for finding truly unique and individualistic artistic talents to create visually stunning ways to drive their stories forward. In the highly stylized opening title sequence for their fourth film, Monsters Inc., the notable influence of 1950’s animation began to appear. Of the many talented artists working at the studio, four names are most commonly associated with pushing this distinctive look forward: Lou Romano, Don Shank, Nate Wragg and, last but certainly not least, Scott Morse. This mid-century style (dubbed in recent years “Cartoon Modern“) is now a signature Pixar artistic stamp. Morse got his animation career off to an early start after being recruited by Chuck Jones’ Film Productions in only his second year of art school. His highly prolific work in the realm of comic books started around this time as well and has scarcely slowed since. 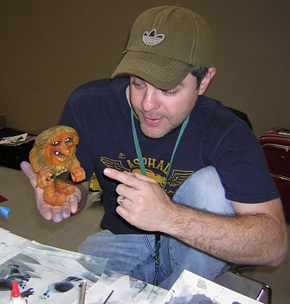 From the late 90’s forward, Morse has worked on many comics and graphic novels (of both his own creation and those of established characters) and has continuously criss-crossed the line between the independent publishing world and that of the mainstream. Titles he has worked on include Magic Pickle, Batman: Roomful of Mirrors, Hellboy: Weird Tales, Catwoman, Meathaus, Plastic Man, Star Wars Tales, Ultimate Spider-Man, Case Files: Sam & Twitch, Bart Simpson’s Treehouse of Horror, Top Shelf Tales, and Elektra: Glimpse & Echo. In the comics world he has garnered the most acclaim for his Eisner Award-nominated graphic novel series Soulwind, collected by Oni Press into one huge volume in 2003. One through-line recognizable amongst much of his output, regardless of genre, is the influence of the previously mentioned mid-century illustrative design style. What takes the work of Morse and his immediate colleagues beyond surface homage is that they take what was laid down before by an earlier generation and layer it with enough of their own style and artistic identities to make it feel completely fresh and new. This is particularly evident in Morse’s vibrant gallery work. 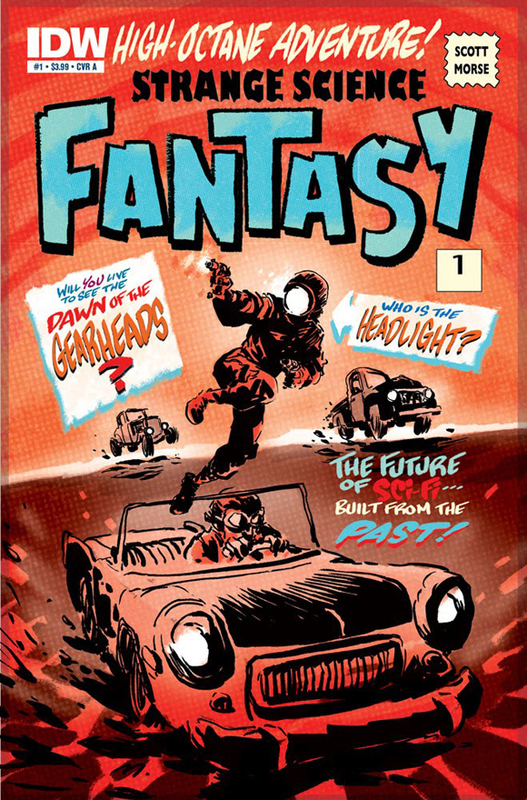 Morse’s latest comic work can be seen in the eye-popping new mini-series from IDW titled Strange Science Fantasy. Morse worked as a storyboard artist on Ratatouille and WALL-E and those skills come into play in the first issue of Strange Science Fantasy. On a purely surface level the book resembles a compendium of the coolest storyboards you’ve ever seen. Favoring overall a three tier, horizontal panel format with minimal explanatory text running below or alongside, Morse treats us to action packed visuals that bristle with energy. This is a creator free of the traditional comic book visual constraints as to how one wishes to tell a story. This is akin to pure artistic expression (not something you’ll find at every trip to the local comic shop) and gives the reader a feeling that the imagery has been poured straight from the artists’ imagination onto the page with nothing to filter or stifle the visions in between. Becoming far too powerful to be controlled by any corporation, the Gearheads set their sights on taking over society itself, only to be confronted by the heavy arsenal of the U.S. military. The Gearheads, with their legion of automotive engine enhanced zoo animals (!?!) face rows of tanks and soldiers head on. Then things really start to get weird. The odd beat of the hep-cat narration fits the rhythm of the imagery perfectly. If the fall of society seen in Mad Max happened half a century earlier it could very well look like this. I can almost picture Max himself with bongos in the backseat and a copy of Howl in the glove compartment. Almost. Strange Science Fantasy #1 (of 6) is, without a doubt, the most interesting and original comic I’ve read this month (#2, featuring a whole new story and characters, should be on stands as of this writing.) If the remaining issues of the series are as dynamic as this, we have a shoo-in for the short list of the very best comics series of 2010.